The best part of winter is that we get to eat soup and for me the time to get my fill of vegetables to ward off the colds and flu that so many people suffer with in winter. It is so important to eat loads of vegetables in winter and this soup will go a long way to keeping your immune system on top of things in winter so have a bowl a day to keep the doc at bay! (makes 8 servings) There are loads of ingredients so print this one and head off to your fruit and veg store, recipe in hand. Add the oil to a large pot on a medium to high heat and add the carrots, onions and celery, cook for a few minutes until the onions are beginning to soften. This should take about 3 or 4 minutes. Now add the stock and the bay leaf and bring to the boil. Toss in the leeks, garlic and green beans, simmer with the lid on for about 5 or 10 minutes, add salt and pepper to taste and then toss in the cauliflower, baby marrows and tinned beans. 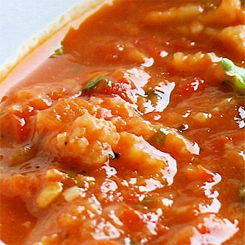 Reduce the heat, add the tomatoes and cook for another 10 to 15 minutes on a slow simmer. Stir in the parsley and serve with a grate of parmesan over the top. I like to take 1 to 1 1/2 cups of the soup and pop it in the blender, blitz it and then stir back into the soup to thicken it up but not necessary. You can also add a cup of cooked rice, 2 medium chopped potatoes or a handfull of pasta shells after adding the stock to change it a bit and make it a meal in a bowl. You can also add some shredded cooked chicken or diced ham to the recipe but whatever you do be sure to have it every day. Seriously folks, if you have a bowl of this soup every day from now until the end of winter you will go a long way to avoiding the winter colds and flu and it is so very tasty you may just want to keep it up throughout the year! Winter is the perfect time to slim down and I came across this excellent challenge being offered by www.slenderchallenge.co.za where 20 people will be selected and will compete to see who can lose the most weight over a 12 week period. The program has been designed to effectively help people lose as much as 350g of fat a day, yes folks, every day. If the program is strictly adhered to, you could be 10 to 12 kilo’s lighter after the first month. Are you ready for the slender challenge? There is a R25000 value prize for the winner, so head on over to www.slenderchallenge.co.za to read about the research behind the program and to put your name forward as a participant. You can also follow the competitors progress on a daily basis through their daily blogs on the site, so even if you are a little skeptical about dieting and the claims they make, here you can follow the real time progress of each person. 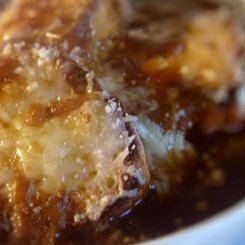 There is something very special about a good French onion soup and what I like best about it is the soaked toasted bread that floats to the top with it’s melted strong cheese and crisp edges on the bread. 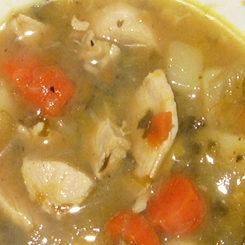 This is a classic French style soup that is great to have a small portion of before a meal. (makes 6 servings) You need soup bowls that can go in the oven. In a pot on a medium to low heat melt the butter and add the onions. Cook them slowly stirring every now and then until they are beautifully soft and beginning to colour. Now continue to cook them stirring frequently until they are a nice golden brown colour, this should take about 20 minutes. Add the stock, season with a pinch of salt and pepper and leave to simmer for 20 minutes or so. Taste it now and add any additional seasoning. Slice up the French loaf into rounds that are about 1 1/2cm thick and toast them on both sides by placing them under the grill in the oven. 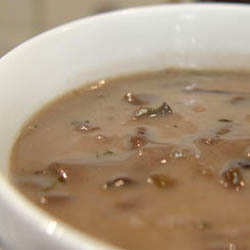 Now place 2 or 3 slices of the toast into the bottom of each bowl and pour soup over the bread. The bread will float to the top and now you want to cover it with a generous amount of cheese, pop them under the frill and grill the cheese until bubbling and brown. Serve immediately by placing the bowls on a side plate. Hint: when covering with cheese try not to get any on the sides of the bowl, it will look like a bit of a mess when the cheese browns. It’s wintery now so there are a whole host of soup recipes on the way. Pumpkins have been dramatically reduced at Fruit and veg city so I thought I’d try a really good pumpkin soup recipe. It’s really simple, thick and so good for you. 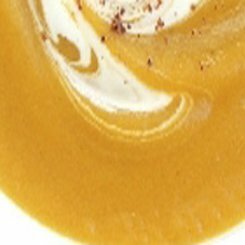 You can also use butternut in this recipe but there is a fabulous butternut soup recipe from Nigella. 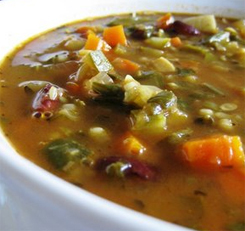 The cooler weather will be closing in on shortly so get your winter soup recipes ready. 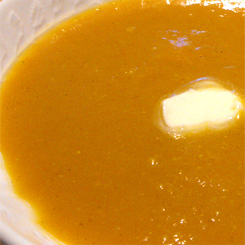 Sauté the onions in the butter on a medium heat, add the stock and pumpkin cubes and simmer until the pumpkin is soft. Add the pinch of nutmeg, salt and pepper and let simmer for another minute or so. Serve it with a swirl of fresh cream or just as it is with some warm crusty bread. For a different and more intense flavor you can roast the pumpkin with some olive oil and blend together with 1 tablespoon of sugar added to the chicken stock. Heat an oven to 200 Celsius and spread the chopped vegetables over a baking tray. Drizzle over some olive oil, getting a little on each piece of vegetable, then give a sprinkle of nutmeg and cinnamon, about 1 teaspoon of each and bake for 1 hour. The vegetables should have little brown bits on the edges and be soft. In 3 or 4 lots blend the vegetables with about ½ a cup of hot vegetable stock. You want a nice thick consistency which you will thin down later. Once you have blended all of the veg and transferred to a bowl, add vegetable stock to get the consistency you like. It should still be thick and wholesome. 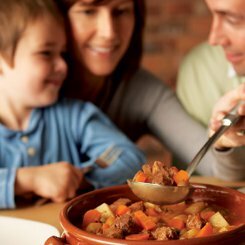 Serve with a generous amount of sour cream, warm crusty bread and some of the leftovers from Christmas day for a fabulous quick meal. As a hangover remedy, spice it up with some Tabasco sauce. Try the Mango and avocado salsa recipe for your leftover gammon. In a large pot, add the stock and sweet corn, bring to the boil and reduce to a simmer. Add the chicken cubes, stir and then mix together the maizena and water, pour into the soup and allow to simmer for about 4 or 5minutes with the lid off. Beat the eggs well and then with a spoon swirl the mixture and pour in the egg slowly. This will create the long strings of egg you want. 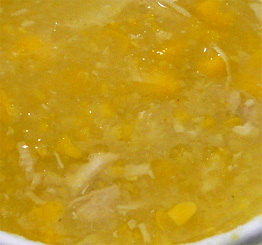 That’s it, glossy Chinese Chicken and corn soup. In a pot on a medium heat melt the butter and gently cook the onions until they are soft. Add about 2/3 of the mushrooms and cook for 2 minutes until softened. Sprinkle the flour over the onion and mushrooms and stir unril mixed together uniformly. Dissolve the stock cubes in the water and add to the mixture along with the rest of the mushroom and the lemon juice and simmer, stirring constantly until the mushroom slices are soft. Now add the cream, stir to combine, taste and season to your liking then remove from the heat. Stir for another 30 seconds and serve. Have it as a starter with the buttefly lamb or the chicken schnitzels. On a baking tray, place the tomatoes, garlic head and onions, drizzle over a little olive oil and roast at 160 Celsius for about 45 minutes until the garlic and onions are light brown. Peel the onions and chop them roughly. Squeeze the garlic out of the skins. Chop up the tomatoes, half roughly and half as finely as you can. In a large pot, add the vegetable stock, garlic, tomatoes and onions and bring to the boil, reduce heat and simmer for 5 minutes. If you have a hand blender and want it a little less chunky, just give it a few short bursts in the pot. Add the basil and mint and season with salt and pepper and let it simmer for another 5 minutes. Serve with warm garlic bread. Fantastic and well worth the effort. first off, be sure that you wash the vegetables thoroughly, especially the leeks, they have a tendency to have sand hiding in between the layers. Chop and slice away. Heat a pot on a meadium heat with some olive oil and add the vegetables. Stir them around to sweat them a little and begin to soften. Add the water and crumble in the 2 stock cubes, bring it to the boil and then add the chicken slices. Reduce the heat and simmer for 20 minutes or so with the lid on and lastly toss in the parsley, season with pepper and simmer for another 5 minutes. Thats it, you are done. Serve with warm crusty French loaf. Double up if need be and leave it on the stove to reheat whenever you feel the need. 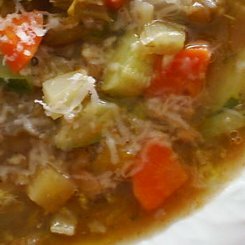 This is a very old real Italian minestrone recipe that is full of flavor and is a meal on it’s own. It serves 4 with some left over for a late night snack. It may sound like a lot of work when you read the ingredients list, but really, it’s just chopping and really well worth it. It’s traditional and a perfect winter soup. In fact you should always have a nice veg soup of some kind in the winter, helps keep the pesky flu away. Heat the oil and butter in a large pot, add onions and cook till the edges start turning brown. Add the carrots and potatoes, cook for 2-3 minutes. Add the celery, cabbage, water and tomatoes, then break up the stock cubes and crumble them into the pot. Bring it to the boil and then reduce the heat and let it simmer for covered for 1-1 ½ hours. The soup should be fairly thick at this point, if it is not leave the lid off and simmer for a further 15 minutes, now add the beans, season with salt and pepper and simmer for another 15 minutes. We like to serve it with garlic bread and a little parmesan.